Featuring a comfortable and natural stride, the Best Fitness E1 center drive elliptical trainer offers patented technology that ensures the shape of the ellipse is biomechanically correct. This means the machine moves in the same natural motion as your body does, providing a true running feel. 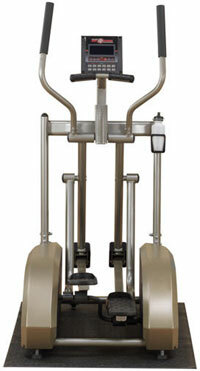 Inferior designs can have either too much vertical movement or too much horizontal movement; those units will often make the user feel off-balanced while exercising. The E1, however, will keep you in a balanced upright position for a stable and secure feel. The E1 also has a balanced steel frame which eliminates rocking while maintaining a compact footprint, which makes it ideal for your home workout area (particularly when space is a concern). Combined with its durable components, the steel frame supports users up to 275 pounds while the unit’s front transport wheels make it easy to move around. Proper pedal spacing on this elliptical eliminates hip fatigue–when your feet are forced out too wide or in too narrow, your body will incur undue strain on your hips. The E1 also offers a comfortable step-up height to allow you to start your workouts safely while its moving arms recruit your upper body and core to the workout, making this a total body trainer. The E1 offers a compact footprint that’s ideal for smaller spaces. To track your workout metrics, the E1 offers contact heart rate handles for advanced monitoring. Additionally, the console offers feedback such as time, distance, speed, and calories so you can can track your workout, push yourself to the next level, and help accomplish your fitness goals. With 17 levels of smooth resistance, this trainer will challenge everyone from beginners to seasoned fitness gurus while 12 unique fitness programs offer variety to keep your workouts fresh and challenging. The E1’s console tracks your time, distance, speed, and calories while proper pedal spacing eliminates hip fatigue. Best Fitness is a member of the Body-Solid, Inc. family of products, a leading manufacturer and distributor of high quality fitness equipment for the home and commercial markets. With over 20 years of experience, Body-Solid offers a wide array of products in the industry including multi-station gyms, free weight machines, a complete line of cardiovascular products, weight plates, kettle bells, dumbbells, and fitness accessories. Originally founded in 1989, Body-Solid has grown from its original 10,000 square foot warehouse to an over 200,000 square foot distribution facility and worldwide head quarters, based just outside Chicago in Forest Park, Illinois. The company sells its products in the United States, Canada, and over 100 other countries worldwide. Body-Solid’s dedication to quality craftsmanship, customer service, and value has enabled it to develop a premier reputation within the fitness equipment industry. In particular, the company is known for its industry leading in-home lifetime warranty and its strong commercial warranties. The majority of Body-Solid’s products are made in an ISO-9000 certified facility to exacting quality and performance specifications defined by the company. Body-Solid is recognized as a premier supplier of fitness equipment to the home fitness market with products for all your workout needs. Having high quality fitness equipment that best suits your needs is an important element in keeping you focused on your goals. Body-Solid products are engineered to accommodate your fitness level, your goals, and your lifestyle. Elder jock I received my elliptical trainer in a well-packaged container which prevented any damage to the components. I was able to assemble it myself with some degree of difficulty in about 2 hours. So far I have been very pleased with the operation of the ellipital trainer. The stride is comfortable, not too long and doesn’t put undue stress on the hips. It is quiet when in use, allowing one to watch television without a home theater for amplification. The only problem I have found is there is some jerkiness when at higher tension levels. I haven’t tried any of the programs so I can’t comment on them. The trainer doesn’t take up a lot of room (unlike the treadmill it replaced)! Overall I would recommend this product, particularly if space is limited.